Munk in the City is an initiative organized by the Urban Policy Lab that asks students to step out of the classroom and into the community to grapple with urban policy issues first-hand. 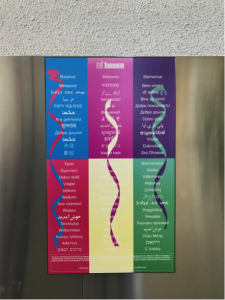 To see all student submissions, visit the project’s Tumblr page. Hi all! This is Jolene and Meredith, two students from the Munk School of Global Affairs and Public Policy. 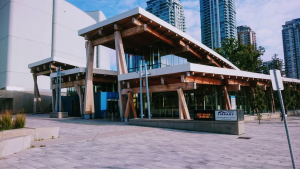 We began our morning of exploring Ward 21 Scarborough Centre with the Munk in the City initiative commuting from densely populated wards by bus, multiple subway lines, and the Scarborough RT, and met up at the Scarborough Town Centre. We were told that the Scarborough Town Centre had an interesting mix of activities for different people. 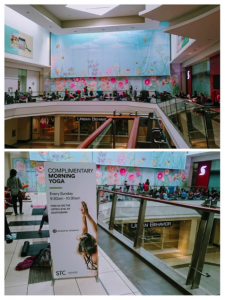 The free yoga offered by Lululemon drew a large crowd of both young and old from all over Scarborough. We wished that we had worn athletic gear so we could join in! 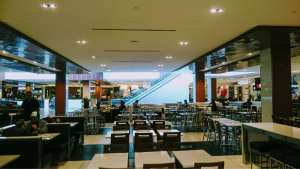 As we walked down to the food court and found many people taking a break from their morning walks through the mall and families and friends congregating for breakfast. A teenage resident cited “General safety concerns at night”, but enjoyed the closeness and community aspects of high rise living. 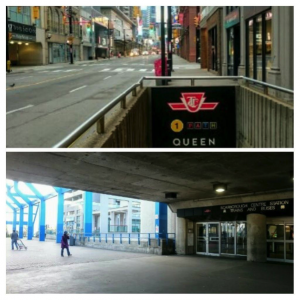 Of major concern: Transit, transit, transit. Services downtown are not accessible for residents and public consultations are frustrating, seeming not to lead to satisfying outcomes. We spoke with a few people who felt left out from some of the cultural events happening downtown, such as plays and musicals, because of the long and unreliable commute. 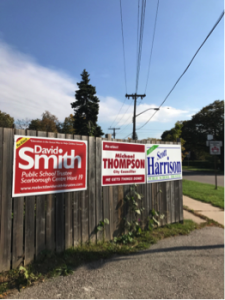 An important theme we noticed is that most of the people we spoke to did not have much to say regarding the upcoming election – many residents told us that they did not have any comments or concerns. Some of those who did have comments expressed worry and frustration, and felt as if their concerns were being ignored. Some also had difficulty finding information on candidates online and felt that they couldn’t be adequately informed before the election. 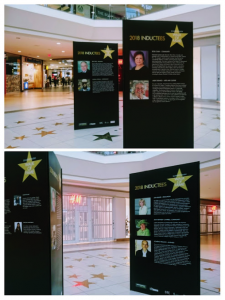 As we walked through the mall, we stopped by a display of recent inductees to the Scarborough Walk of Fame, which celebrates residents who make great contributions to the local and city-wide community. It was interesting to read about some of the people who take pride in their neighbourhood and work hard to make an impact on the broader community. 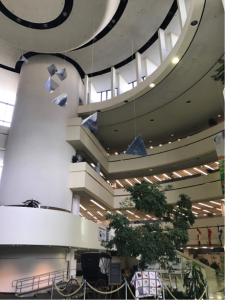 After leaving the mall, we went to the nearby Scarborough Civic Centre. Many people leaving had just undergone training for working at the polls on election day. We met some friendly folks registering people for their training sessions from all over Toronto. We heard about issues like safety, and difficulty finding affordable housing and jobs. 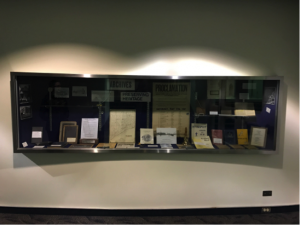 After speaking with some residents, we also checked out some of the archives and artwork displayed around the building that gave us a taste of the community’s history. The public library across from the Civic Centre was beautiful, but unfortunately it was closed when we were there. 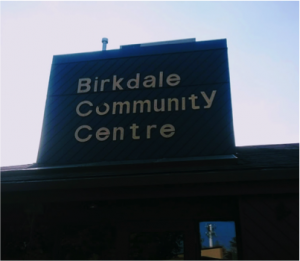 At the Birkdale Community Centre nestled in the woods, we found arts programming for children and schedules for a variety of community classes. The attendees we spoke to at the centre had no comments on the ward’s issues. Posters and flyers about community programs and services covered most of the walls, and we chatted with a young man who was setting up for a children’s art class that afternoon. This was a great spot to learn about some of the services available in the community. 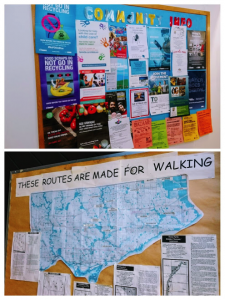 On the walls we found City of Toronto information, community resources, and a walking route chart. After our visit to the community centre we walked through the Birkdale ravine and enjoyed some of the beauty of the city’s greenspace. 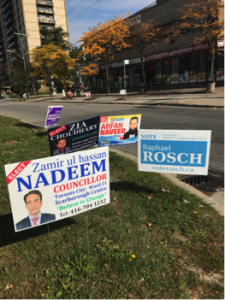 After walking a very long stretch of industrial businesses, we passed by a great many lawn signs, some listing different wards. Ward 17? 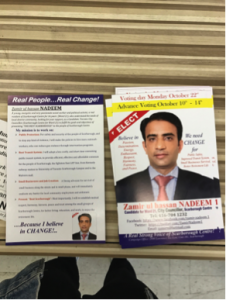 Ward 20? It seems that with the updated wards, there is a lot of confusion about who is where with regards to the upcoming election. We then reached a hub with several small businesses and election offices. 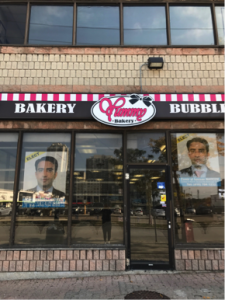 In one of these, a former bakery with some equipment but no furniture, we found materials from candidate Zamir ul hassan Nadeem’s campaign for Councillor of Ward 21. 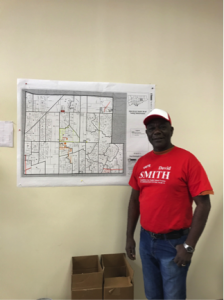 In another office we found the incumbent Public School Trustee, David Smith, waiting with a bright red campaign shirt and lots of enthusiasm to chat with us about the ward. 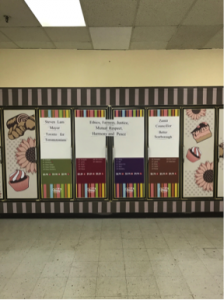 We found out this ward had 38 schools and will be down to 27 with the new boundary. The number of students declined to just above 5000. Smith previously had to communicate with multiple Members of Parliament and Members of Provincial Parliament before the redesign. The area has a great number of educational services, and the incumbent’s priorities include early childhood education and languages. We are grateful to Mr. Smith for taking the time to speak with us and share his insight. There are many who want to see this area grow and evolve. 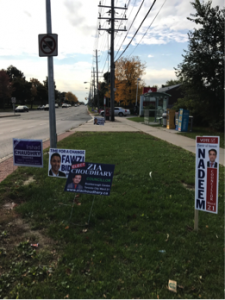 The people we spoke to mentioned improvements in safety, transit access, housing, and employment as some key concerns that they’re thinking about as the election approaches. 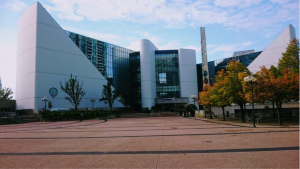 However, the ward signs espousing different numbers from 17 to 21, as well as some confusion and indifference about candidates and their platforms, left us with the feeling that an even larger number of people are not engaged and that the changes to wards before the election have not assisted. What do you think are some solutions to these barriers to participation in municipal politics? Thank you for following our journey through Ward 21! Make sure to go out and make your voice heard on October 22nd.